To create a saved search, first execute a Simple or Advanced search within any of the three lists. Click the "Save Search" button. 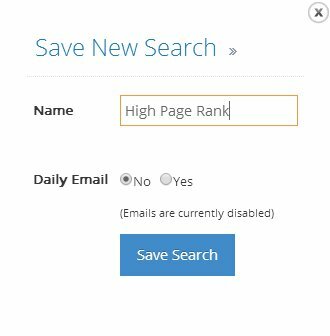 Enter a "Name" for the search and select whether you would like a daily email with a list of domains that match the search parameters. Saved searches show up in the drop down at the top of your page. To execute any Saved Search, you simply select it from the drop down.